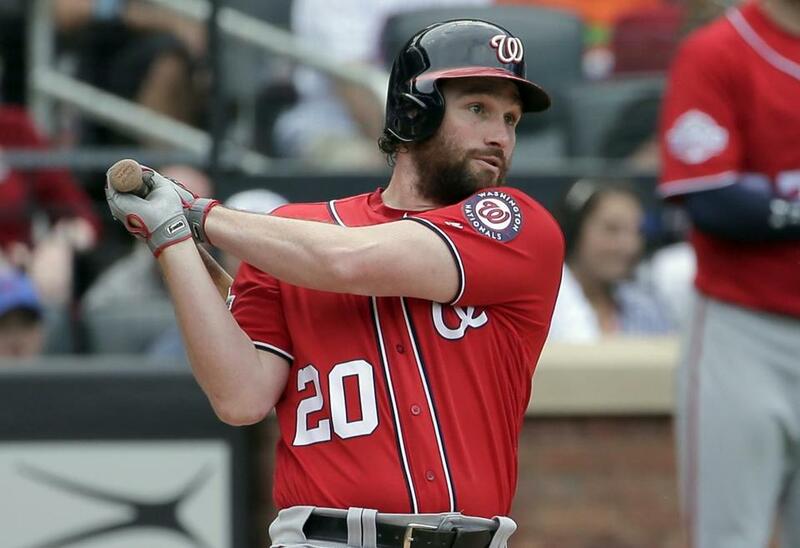 Second baseman Daniel Murphy was traded to the Chicago Cubs for a Class A infielder and a player to be named or cash. The Washington Nationals, who entered Tuesday night’s game with a sub-.500 record and trailing the Atlanta Braves by 7½ games in the NL East, dealt second baseman Daniel Murphy to the Chicago Cubs and first baseman Matt Adams to the St. Louis Cardinals, essentially throwing in the towel on a disappointing season. The Nationals were coming off two consecutive division titles under manager Dusty Baker, who was fired after last season and replaced by rookie skipper Dave Martinez. For Adams, the Cardinals are sending $50,000 to Washington. For Murphy, the Cubs are swapping Class A infielder Andruw Monasterio and a player to be named or cash. A jersey that Mickey Mantle wore in Games 6 and 7 of the 1964 World Series was sold at auction for $1.32 million. Mantle homered in both games to give him 18 for his career, a World Series record that still stands . . . Yankees shortstop Didi Gregorius (.270, 22 home runs, 74 RBIs) was placed on the 10-day disabled list because of a bruised left heel . . . The Angels put Justin Upton on the 10-day DL with a cut on his left index finger, but expect Mike Trout will rejoin the team by the end of the week . . . Giants catcher Buster Posey, 31, might need hip surgery that would end his season . . . White Sox manager Rick Renteria was released from a Minnesota hospital after undergoing tests following an episode of lightheadedness during Monday night’s game . . . Marlins righthander Jose Urena dropped his appeal of a six-game suspension for intentionally hitting Atlanta rookie Ronald Acuna Jr. with a pitch and began serving the penalty Tuesday. Serena Williams got a bit of a boost in the seedings for the US Open by being placed at No. 17, nine spots above her current ranking. The USTA’s decision means Williams avoids a possible matchup against one of the top eight players in the third round. It also sets up a possible matchup at that stage against her older sister, Venus, who is seeded 16th. Williams, who turns 37 next month, has won the US Open six times, most recently in 2014 . . . Anett Kontaveit beat seventh-seeded Kiki Bertens, 3-6, 6-2, 6-2, in a first-round match at the WTA’s New Haven Open at the Connecticut Tennis Center at Yale . . . Roger Federer and Wimbledon champ Novak Djokovic will headline a six-player team from Europe that will face a team of players from the rest of the world in the Laver Cup on Sept. 21-23 in Chicago. Joining Federer and Djokovic will be Alexander Zverev of Germany, Grigor Dimitrov of Bulgaria, David Goffin of Belgium, and Kyle Edmund of Britain. Argentina’s Juan Martin del Potro and Diego Schwartzman will play on the World team along with Americans John Isner and Jack Sock, Wimbledon runner-up Kevin Anderson of South Africa, and Australian Nick Kyrgios. John McEnroe and Bjorn Borg return as coaches. Guard PJ Dozier, who played in two games last season with the Thunder, signed a two-way contract with the Celtics . . . BC sophomore running back AJ Dillon and senior safety Lukas Dennis were voted to the AP’s preseason All-America second team . . . LSU offensive lineman Ed Ingram, 19, was arrested on sexual assault charges in early August, around the same time the projected starter was suspended from the Tigers’ program for an unspecified violation of team rules . . . Texas Tech running back Da’Leon Ward was arrested on a charge of theft between $2,500 and $30,000. School officials wouldn’t comment on the matter . . . Arizona sophomore forward Ira Lee was cited and released for driving under the influence last weekend in Tucson, Ariz. He faces misdemeanor charges that include ‘‘super extreme’’ DUI involving a blood alcohol content of 0.20 or higher . . . Ottawa Senators assistant general manager Randy Lee resigned amid charges of harassment stemming from an incident at the NHL scouting combine in May. Lee, 56, is accused of making lewd comments and rubbing the shoulders of a 19-year-old male shuttle driver at the combine in Buffalo . . . Rich Berberian Jr. of Vesper Country Club shot a 5-under-par 67 in the second round of the New England PGA Championship to open a three-stroke lead over Jeffrey Martin (Wollaston GC) heading into Wednesday’s final round. The tournament is being held at Quidnessett and Warwick country clubs in Rhode Island . . . IndyCar driver Robert Wickens, 29, had titanium rods and screws placed in his spine to stabilize a fracture associated with a spinal cord injury suffered in a weekend crash at Pocono Raceway . . . Breanna Stewart, who averaged 21.8 points to help the Seattle Storm earn a bye until the semifinals of the WNBA playoffs, was voted the league’s AP player of the year. Atlanta’s Nicki Collen was chosen as the coach of the year, and Las Vegas Aces center A’ja Wilson was the unanimous choice as rookie of the year.